Re: Set prefered window size? Subject: Re: Set prefered window size? 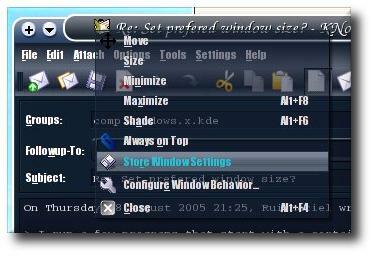 >> Rightclick the titelbar and choose "Advanced"|"Special Window Setting"
>> and go to the "Geometry" pane. /always/ have to resize KNode when I start using it. > doesn't matter how I re-resize it because it always starts that way. sometimes, but I am not too sure if it was just a fluke. size to the old settings, I'd probably have a hard time.